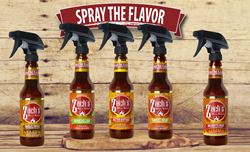 Zach's has introduced the world of grilling to the very first Sprayable Wing Sauces. Handcrafted in small batches out of Saint Louis, MO, these artisan wing sauces are making anyone's favorite wing stop their own backyard. Born and raised in St. Louis, Missouri, owner Floyd Thomas III, along with his son, Zach, started experimenting with making wing sauces with two very simple goals-they have to be easy to use and the flavor must be amazing. The traditional processes of marinating, basting and tossing wings with sauces takes a lot of time, effort, patience and materials. With Zach being a recent college graduate, living on his own and new to cooking for himself, and Floyd being a seasoned cook, the collaboration and outcome was groundbreaking. Inspired by the rising preferences in heat-based foods and the craft beer movement, Zach also factored in the intentions for the sauces to be spicy but flavorful, and small batch rather than mass-produced and generic. Spraying sauce onto wings is a novel idea that turned into true invention. Add in the desire to keep it "clean" and make sauces from premium ingredients, minus the preservatives, fillers, artificial ingredients, and voila, Zach's Wing Sauce!